Pence, a conservative Christian, took direct aim at Rep. Ilhan Omar, D-Minn., one of the first two Muslim women in Congress. She has been condemned for tweets criticizing AIPAC and promulgating what some say are anti-Semitic views. The vice president, who did not mention Omar by name, lamented that a House newcomer had “trafficked in repeated anti-Semitic tropes,” listing a number of Omar’s more incendiary assertions. “Anti-Semitism has no place in the Congress of the United States of America,” Pence said, as applause washed over the convention hall. 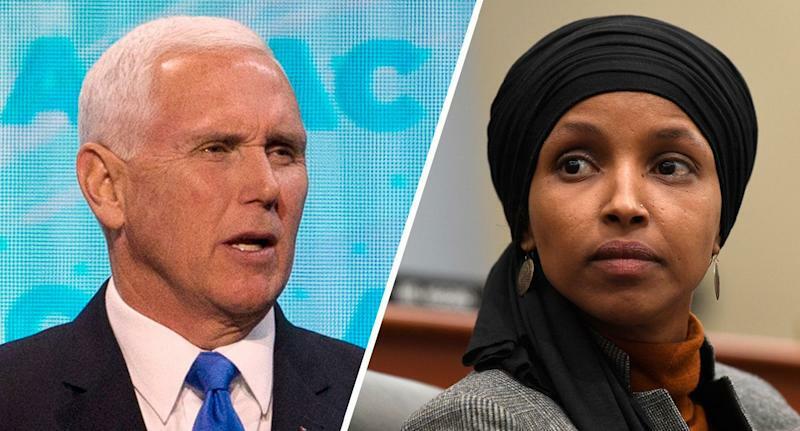 Pence also suggested that Omar should be removed by Democratic leadership from the House Foreign Affairs Committee, echoing what has been a popular refrain for her detractors. There was again loud cheering. Several Republican members of Congress have also stood accused of anti-Semitism. Nor did the 2020 presidential candidates escape Pence’s contempt. Urged by progressives groups to stay away from the pro-Israel conference, virtually all major candidates said they would not attend AIPAC. “It is wrong to boycott Israel and it is wrong to boycott AIPAC,” Pence said, referencing not only the candidates’ absence but the “boycott, divestment and sanctions” movement that seeks to cripple Israel’s economy. While he focused on Israel, Pence opened his remarks with reference to the report of special counsel Robert Mueller, who spent two years investigating the Trump presidential campaign’s allegedly improper connections to Russia. That report was submitted to the Department of Justice on Friday and, in its lack of new indictments, appears to be favorable to Trump, if not entirely exculpatory.